This week marks the end of the regular season for college baseball’s DII, NAIA and DIII divisions. While the preseason rankings were determined using projections, assumptions and intuition, the updated rankings below were conceived based multiple months of on the field action as opposed to a spreadsheet or an educated hunch. These schools have provided a season’s worth of data to examine and their superiority is difficult to argue. They are unequivocally the best teams in the nation. Nevertheless, end of the regular season rankings don’t amount to much. No one remembers who was ranked number one at the beginning of May, but instead who wins the national tournament to close the season. For a team like Tampa, who has been the number ranked team all season, their season long accomplishments will be unfortunately diminished if they aren’t able to remain the last team standing. The Spartans, along with Oklahoma Wesleyan and Oswego State are the current top teams in the Perfect Game rankings. Realistically, the odds are unlikely that each will go on and capture their division’s national championship. The top ranked team more often than not doesn’t win the title. A perfect example was when Fresno State captured the DI College World Series title in 2008. They were 33-27 at the end of the regular season and had they not won the WAC tournament they wouldn’t have been playing in the NCAA tournament – and no one would have made a stink about their omission. Along their way to the championship they they eliminated the University of North Carolina in Omaha. That Tar Heel team has six players currently active on MLB rosters and another in AAA who has played in the majors and was the second overall selection of the subsequent year’s amateur draft. UNC was EXTREMELY talented yet couldn’t win it all. Nevertheless the Bulldogs became the lowest ranked team to ever to win an NCAA Baseball Championship. Also of note, they were the fifth consecutive school to take home the title that wasn’t a national seed to further demonstrate that the pollsters predictions of the champion often miss the mark. Tampa, OKWU and Oswego State have a lot to prove and will have to go against the most elite of competition to remain number one – the rest of teams in the following tables. Following are the factors which will work for and against them as they attempt to continue their season long success. Rankings are based on games through Sunday, May 7. The Spartans have been the top team in the Perfect Game rankings every week including the preseason and have done little to give doubt they are deserving of the distinction. They have an imposing 34-12 record despite a schedule chock full of formidable foes. George College, Southern Indiana, Flagler, Nova Southeastern, Florida Southern, Florida Tech and Lynn are all teams which have been ranked at one time this season and have suffered losses to UT. Despite that lineup of top-shelf opposition and their corresponding pitching staffs, the Spartans have a incendiary offense which ranks fourth in the entire nation with a .343 batting average, is seventh in slugging percentage at .534 and is also 12th in runs (415) and 18th in on-base percentage (.416). Coming into Saturday night’s game the Herculean Tampa team had scored at least 11 runs in their previous half-dozen games, averaging 14.5 runs per contest. If J.D. Osborne isn’t DII’s top offensive player, he’s darn close. For the season he’s hitting .381 with a sixth the nation 18 home runs and second in the division 75 RBI. He’s also been an invaluable asset in the field as he’s put in time at first base, third and catcher. One of the many recipients of Osborne’s prolific stroke has been leadoff hitter Kevin Santa. The sure-handed, keen-eyed senior shortstop has scored 62 times while batting a team high and third in the SSC .417. In 289 DII’s at bats, he’s impressively only struck out 21 times. Tampa also boasts one of the nation’s top starting pitchers, David Lebron. He’s has yet to suffer a setback, earning a 7-0 record while striking out over a batter per inning yet holding opposition to a .221 batting average. The Spartans also have the highly touted Garrett Gave, a top MLB pitching prospect, in their bullpen. Tampa has won seven national championships, including two of the last four seasons. With talent, experience, confidence and coaching, it wouldn’t be wise to wager against them returning home with the title once again. As daunting as the Spartan’s offense is, the pitching staff doesn’t have quite the level of intimidation. Lebron is a legit number one, but no other hurler on the staff has the same statistical prowess he has. While Cave’s pro potential brings scouts to the yard he still needs to harness his ability. For the season he has a 4.80 ERA and some Ricky Vaughn-esque control issues with both 11 wild pitches and HBPs. The rest of the staff’s team 4.00 ERA doesn’t scream of dominance and national caliber potential, albeit that number is still lower than the UT’s ERA when they last won the title in 2015. An Achilles’ heel for Tampa may be the base paths. They are last in their conference in stolen bases with only 36 on the season. Alternatively, while opposing teams haven’t been blistering the base paths with a proliferation of stolen bases, they have been successful when looking to swipe an extra base. Against UT’s primary backstop opposing teams have been successful in 49 of 51 attempts. Despite being the unequivocal number one in these rankings, Tampa hasn’t received the same level of love from other pollsters. Currently Tampa is behind Delta State in the official South Region rankings meaning Tampa would have to travel to Mississippi for the opening round. The Spartans have only stepped outside the Sunshine State once this season, a series loss to Tusculum in Tennessee. Dropped out: West Texas A&M (23). Last year Oklahoma Wesleyan was positioned fourth in the preseason rankings’ however despite that lofty prognostication things didn’t go as anticipated. The Eagles still had a decent season, but they fell well short of their goal and played in the National Christian College Athletic Association tournament rather than the NAIA National Championship Opening Round. The returning roster for this season had much of the same talent as last year, which in turn had a number of the carryovers from the year before. With that it was unquestioned if OKWU had the talent to compete, but whether or not they had the mindset and motivation to put it all together. The answer to that question has been answered in spades. Oklahoma Wesleyan entered the top ten in the first update and slowly worked their way to the top spot three weeks ago. Along their way they’ve defeated the accomplished ilk of Tabor, Lyon, Sterling and York as well as swept three games from Bellevue. They’ve been especially stunning the coming down the stretch as they gone 20-2 to claim both the Kansas Collegiate Athletic Conference regular season and tournament titles. Over their last seven games, which included their conference tournament, the Eagles have averaged over 13 runs per game. A dozen Eagles earned all-conference accolades and the honors are throughout the roster with an accomplished team on offense and on the mound. At the plate the team is leading the nation in runs, is second in hits and third in both batting average and slugging percentage. Their pitching numbers are as nearly as impressive as they are eighth in ERA, 26th in strikeouts and 39th in opposing batting average. KCAC Player of the Year Chris Acosta-Tapia, Will Price and Trevor Achenbach comprise a brutish trio who’ve amassed 61 home runs between them and are batting .459 collectively. It’s difficult to find a chink in the Eagles’ armor. Offensively few teams can compare and their pitchers are talented throughout the entirety of the staff. An argument could be made to claim a few teams are as good overall as OKWU, but it would be difficult to argue that anyone is hands down better. Ultimately OKWU’s biggest weakness may be their postseason inexperience and playing to their ability. Head Coach Matt Parker had a talented team last season but they regrettably underachieved. Instead of playing in the NAIA’s they were relegated to playing in the NCCAA tournament where they were bounced in the first round. Parker will have to keep his team playing at their peak and made sure they don’t rest on their regular season laurels. OKWU is one of a handful of talented teams in the NAIA who are capable of winning the title. Even with a team as outstanding as the Eagles are, bringing the title back to Bartlesville with them won’t be easy. The Lakers started last season unranked, but finished in the top 10 with a program-record 35 wins and their second-straight NCAA regional outing. On the heels of that success they started this season positioned fifth and have stayed in the top ten for the duration of the year with little inkling of falling out. 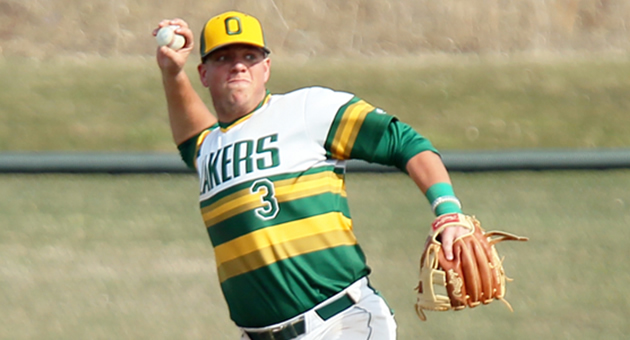 At the end of April the Lakers locked up with DIII stalwart Cortland on the road and took two of three from the Dragons (and were a mere three outs away from a sweep) which vaulted them into the number one position. In addition to their wins over Cortland, the senior laden Lakers have also picked up quality wins against Salisbury, Christopher Newport and Mass Boston. On the rare occasions they’ve lost, the defeats were slim. Six of their eight losses were by a two runs or less and only once did they lose by more than three — the Lakers have shown they can compete every game. With the wins over Cortland and a sweep of Oneonta on the final day of the season Oswego won the State University of New York Athletic Conference regular season crown. With the title someone other than Cortland would have hosted the conference tournament first the first time since 1998. Head Coach Scott Landers, who took over the team in 2011, has transformed his club into a contender quickly. On the mound Tim Cronin has been phenomenal, going 9-0 with a 1.82 ERA. He went the distance in six of his nine starts, with two of them being shutouts. Mitchell Cavanagh has been just as good, if not better. His record is perfect as well as he is 8-0 with a 2.31 ERA. Neither hurler dominates opposition, but they do get them out which is what ultimately counts. On offense the Lakers have a dynamic duo as well. All American Eric Hamilton is hitting .442 and tops the team in runs and doubles. Mike Dellicarri has a .343 average and has 21 extra-base hits in just 108 at bats – seven of which are home runs. Had the Lakers been able to play a pair of mid-April games against St. John Fisher it could have been an additional measuring stick of their potential success. They’ve played a strong schedule, but not overall impressive. As it is, the Lakers still look legit, but another pair of wins would have erased any doubt. The SUNYAC cancelled its conference tournament due to inclement weather as it was rainy with the possibly of snow. With that, the Lakers haven’t played a competitive game since April 29th. Reigniting their competitive juices and knocking off the rust could prove to be difficult. Entering the NCAA’s with a tournament title to match their regular season crown would have been a tremendous propellant for them. The Lakers aren’t a traditional power; far from it. Before Landers took over the club they hadn’t had a winning record in the SUNYAC in a decade and their regional win last spring was their first NCAA victory since 1984. Oswego has demonstrated that they’re a top ten team, they still need to prove they’re as advertised. With a number of star seniors on the team Oswego has playing experience, but not playoff experience which could put them at a disadvantage as they go deeper into the postseason.